I Bet You Had Some Sea Monkeys When You Were A Kid! Looking for a fun, unique Christmas stocking stuffer? You remember Sea Monkeys, don’t you?! Back in the 60s and 70s, plastered on the back of every comic book you’d find an ad for X-ray Eyes or a Secret Decoder Ring… and Sea Monkeys. So you saved up your allowance for weeks, clipped the coupon, begged your mom for a stamp and mailed off your order. And then you ran to the mailbox ever day for a couple of weeks, just waiting for the day those fabulous Sea Monkeys would arrive. Remember how excited you were when the mailman finally delivered your package? Sea Monkeys were fun when YOU were a kid. Now that you’ve got your own kids, why not share one of your own favorite childhood memories? After all, isn’t that what Christmas is all about? Children, memories…and Sea Monkeys! 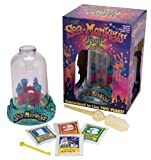 This is the same Sea Monkey Kit you had back in the 60s and 70s when you were a kid. 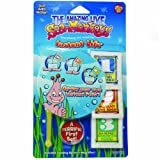 You’re own children are going to love it – especially when you tell them about all the fun you had with your own Sea Monkeys! Maybe you want to set up your own unique environment for your Sea Monkeys. A decorative glass bowl, some colorful marbles, a castle or a deep sea diver? Use your imagination and create your own Sea Monkey habitat. Sea Monkeys will thrive in most any type of container – even an ordinary canning jar. Just make sure it’s clean before you get started and follow the directions for purifying the water and you’re good to go. This kit includes everything you need to get started. All you have to supply is the water and the container. If you’re giving Sea Monkeys as a Christmas present be sure to pick up some filtered or distilled water. It’s going to take 24 hours to purify the water before you can add the Sea Monkey eggs. If you think your kids will be too impatient, use the Water Purification packet to prepare the water ahead of time and keep it out of sight until Christmas. You probably already know what Sea Monkeys are but your kids are going to ask. So be prepared! Sea Monkeys are really a type of brine shrimp and they’re a member of the Crustacea family, like crabs and lobsters. They have an exoskeleton which just means they have a hard, outer shell. Members of the Crustacea family don’t have any bones inside their bodies like we do so this hard, outer shell supports their squishy body from the outside. Sea Monkeys live in the ocean where there are lots of big fish – big fish who like to eat Sea Monkeys for breakfast! Thankfully, their hard shell protects them from these predators. As your Sea Monkeys grow you’ll notice that sometimes they don’t seem to have a shell. That would be bad news if they lived in the ocean, because then their predators could easily eat them! But your Sea Monkeys don’t have to worry because there aren’t any of those big, nasty fish in your aquarium. And don’t worry – their outer shells will grow back! It’s just that your Sea Monkeys are growing, so they periodically shed their shells and grow a larger one that covers their body better. In fact, if you’ve had your pets for a while you might even be able to see their discarded exoskeletons lying at the bottom of the tank. Even Sea Monkeys like a change of scenery every now and then and what could be better than a trip to Mars?! They will love racing through the arches and playing Hide-N-Seek in this extra-terrestrial terrain. This kit is extra fun, especially if your kids are into Sci-fi. It also makes a great gift for a co-worker – something fun and interesting they can keep on their desk. What a great conversation-starter! Everything you need is included in the kit: Water Purifier, Instant live Sea Monkey eggs, growth food, and plasma III, illustrated instructions, feeding spoon and aqua-leash. Ahoy, matey! Avast ye landlubber! Yes, your Sea Monkeys are going to love having their very own Pirate ship so they can rule the Seven Seas! 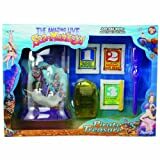 This special kit has a sunken pirate ship at the bottom of the tank and there’s even a searchlight to help your Sea Monkeys find the buried treasure! Kit includes everything you need: aquarium, water purifier, instant live eggs, growth food, and submarine searchlight. Have a Dragon Slayer or Fairy Princess on your Christmas list this year? Here’s the perfect Stocking Stuffer! A Magic Castle fit for only the most Royal Sea Monkeys! So much better than that plain, ordinary Sea Monkey aquarium you had as a kid. This Sea Monkey Magic Castle is the perfect Christmas gift for the fantasy lover on your list. Kit includes everything you need: water purifier, instant live eggs, growth food, and plasma iii, illustrated instructions, feeding spoon and aqua-leash. 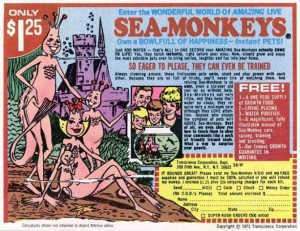 When I was a kid, everybody had Sea Monkeys. I ordered mine from the back of an ‘Archie’ comic book. Where did you get yours? Didn’t they come in one of those weird shake ’em ring toss games one year too? 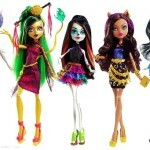 Why Littlest Pet Shop Toys Are Popular With Little Girls? How did Playing Cards get their names? Best Kids Toys Ever is also participant in the Amazon Services LLC Associates Program, an affiliate advertising program designed to provide a means for sites to earn advertising fees by advertising and linking to Amazon.com.